Manic Street Preachers in controv shock! Amid chaotic scenes at Downing College's May Ball, more tempers than trousers flared. James Brown witnessed the events. 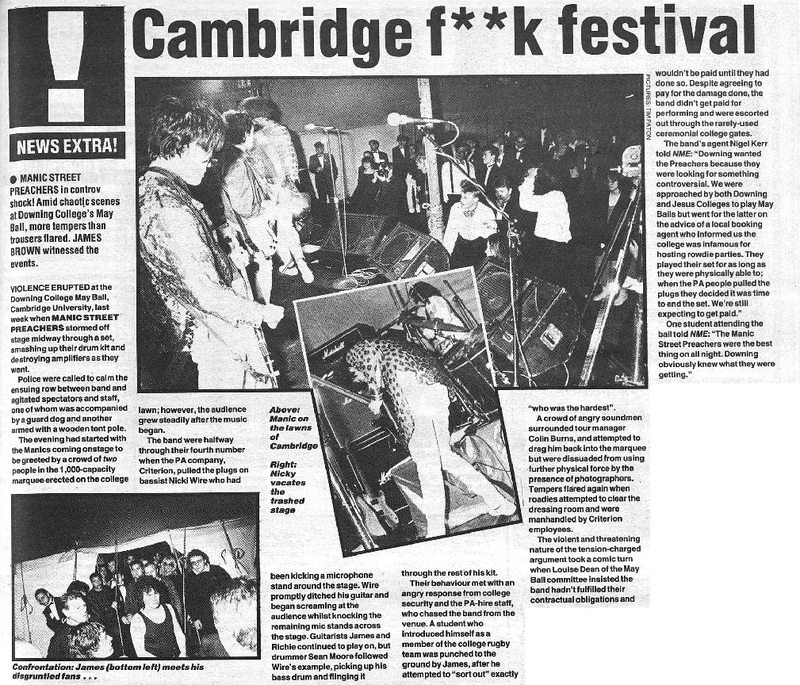 Violence erupted at the Downing College May Ball, Cambridge University, last week when Manic Street Preachers stormed off stage midway through a set, smashing up their drum-kit and destroying their amplifiers as they went. Police were called to calm the ensuing row between the band and agitated spectators and staff, one of whom was accompanied by a guard dog and another armed with a wooden tent pole. The evening had started with the Manics coming onstage to be greeted by a crowd of two people in the 1,000-capacity marquee erected on the college lawn; however the audience grew steadily after the music began. The band were halfway through their fourth number when the PA company, Criterion, pulled the plugs on bassist Nicky Wire who had been kicking a microphone stand around the stage. Wire promptly ditched his guitar and began screaming at the audience whilst knocking the remaining mic stands across the stage. Guitarists James and Richey continued to play on, but drummer Sean Moore followed Wire’s example, picking up his bass drum and flinging it through the rest of his kit. Their behavior met with an angry response from college security and the PA-hire staff, who chased the band from the venue. A student who introduced himself as a member of the college rugby team was punched to the ground by James, after he attempted to “sort out” exactly “who was the hardest”. A crowd of angry soundmen surrounded tour manager Colin Burns, and attempted to drag him back into the marquee but were disuaded from using further physical force by the presence of photographers. Tempers flared again when roadies attempted to clear the dressing room and were manhandled by Criterion employees. The violent and threatening nature of the tension-charged argument took a comic turn when Louise Dean of the May Ball committee insisted the band hadn't fulfilled their contractual obligations and wouldn't be paid until they had done so. Despite agreeing to pay for the damage done, the band didn't get paid for performing and were escorted out through the rarely-used ceremonial gates. The band's agent Nigel Kerr told NME. "Downing wanted the Preachers because they were looking for something controversial. We were approached by both Downing and Jesus Colleges to play May Balls but went for the latter on the advice of a local booking agent who informed us the college was infamous for hosting rowdie parties. They played their set for as long as they were physically able to; when the PA people pulled the plugs they decided it was time to end the set, We're still expecting to get paid." One student attending the ball told NME: "The Manic Street Preachers were the best thing on all night. Downing obviously knew what they were getting." This page was last modified on 22 March 2018, at 19:44.